I started this blog after reading The Happiness Project by Gretchen Rubin. Actually it was the second time I had read it. I decided that more happiness was something I could live with. Also, found that I loved blogging and wanted to add more visuals to my blog Purple Glasses Club, a blog about school libraries, children’s books and technology. I bought a great camera and started taking tons of photos, none of them matching my professional writing. A happiness blog seemed just the ticket. While my life has transformed in ways I could not have imagined and I have blogged rather sporadically, I still love posting my happy things. There have been so many posts I meant to write, so many beautiful photos I intended to share, but the thinking and dreaming, the mulling subjects of joy and delight over I my brain has added greatly to my own happiness. It may be selfish, but I do not regret claiming joy even when it is destined to be my lonely satisfaction. Recently I stumbled across an app that ramps up my joy reflection perfectly. 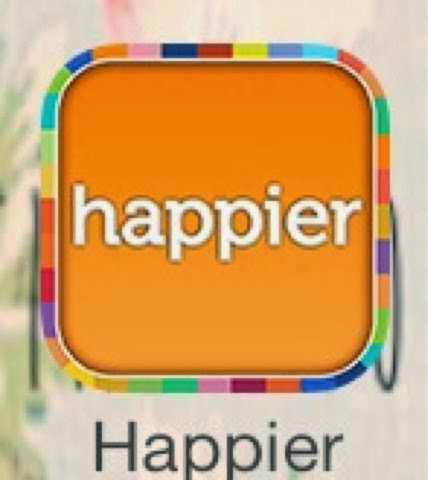 Happier is an app the whole purpose of which is recording and sharing happiness. A note on the app indicates that research has determined that people who write down 3 things they are grateful for each day are happier than those that do not. It’s like Twitter for happiness. Instead of liking or retweeting, you smile at posts. Every time you post a happy event confetti streams down. I won’t bother to tell you what happens when you post 3 times in a day, you’ll want to discover that for yourself. So I’m thinking of short happy thoughts to add to my list because I just love seeing the confetti. There is this radio show that I listen to once a week that has a happiness hour and it has given me so much wisdom. Great word! Sounds great! I find that making the time to use the app has made me appreciate my happy moments much longer.